Considered by some as the national dish of Poland; it is ancient in origin, traditionally cooked in a cauldron over a fire. The ingredients were whatever game was shot from the forest, plus smoked meat and sauerkraut which travelled well. 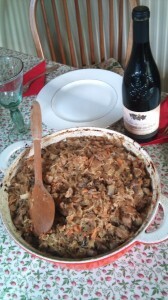 Bigos is a wonderful winter dish which seems to improve each time it is reheated! Thoroughly wash bottled/bagged sauerkraut to remove salt and vinegar and squeeze dry. Finely slice fresh cabbage and cook in a little water for 10 minutes and drain. Mix sauerkraut and fresh cabbage, then add coarsely grated carrot, dried mushroom, bay leaves, peppercorns and seasoning. Cut meat into small pieces (c.1.5cm cubes), put into a saucepan on a low heat to remove excess moisture, then add oil and finely diced onion and cook until lightly brown. Thoroughly mix all ingredients together in a large bowl, transfer to a covered casserole dish and add two large glasses of wine. Place the casserole in an oven, pre-heated to 150 degrees, and cook for about 2 hours. Turn off the heat and leave the casserole in the oven for a further half an hour to finish cooking. Serve with fresh bread and a good robust red wine. The sauerkraut, dried forest mushrooms and vegetable seasoning are best purchased from a Polish shop.